Angel Barn in Bitterley, near Ludlow sleeps 2 people. 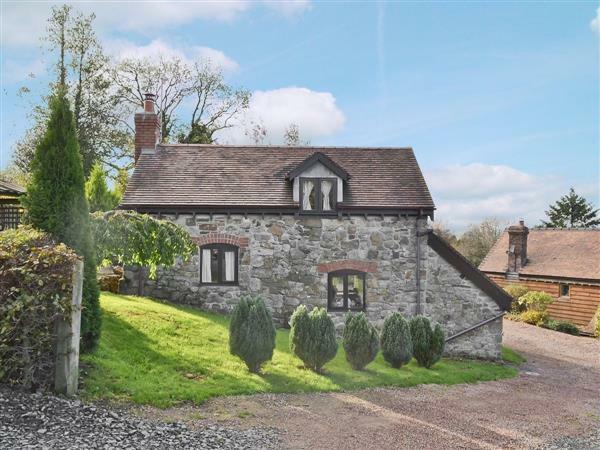 This detached cottage is nestled away in the grounds of the owner’s home and situated in an area of Outstanding Natural Beauty, Angel Barn is the perfect location for guests wishing to really enjoy the magnificent Shropshire and Herefordshire countryside. Located on the slopes of Clee Hill in the heart of Shropshire, Angel Barn is a beautiful stone built, detached barn which offers guests fabulous views and peaceful surroundings. Perfectly located for guests to visit and explore the local area, guests will find the historic market town of Ludlow just a few miles away. Perched on a cliff above the River Teme, Ludlow is surrounded by unspoilt, hilly countryside of south Shropshire and the Welsh border country known as the Welsh Marches. Every September there is the famous Ludlow Food and Drink Festival where guests will be able to sample top quality local produce and Michelin starred food. Angel Barn is a great base for guests who enjoy walking or cycling as there are many excellent public footpaths and cycle paths running right through the area and taking guests through some of the most picturesque countryside in the county. A little further afield but still within easy driving distance, guests will be able to visit Tenbury Wells, Leominster, Bridgnorth, Bewdley, Ironbridge and Stokesay castle. Shop and pubs serving food 1½ miles, restaurants 4 miles. Ground floor: Living room with beam and tiled floor. Kitchen with tiled floor. Bathroom with shower attachment, toilet, beams, Velux and sloping ceiling. First floor: 1 double galleried bedroom with beams and wooden floor. Woodburner in living room (initial fuel included). Oil central heating, electric, bed linen and towels included. Freeview TV. Electric cooker. Microwave. Washing machine. Garden. Small courtyard with terrace, sitting-out area and furniture. Shared tennis court. Parking (2 cars). Cycle store. Natural water supply from borehole. Welcome pack. Pet free of charge. No smoking. NB: 3/4 steps in courtyard. Water feature in grounds, 250 yards. Holidays at Angel Barn run from Saturday to Saturday. For a better idea of where Angel Barn is, you can see Angel Barn on the map below. Angel Barn is in Shropshire; should you be on the lookout for a special offer, you can find all the special offers in Shropshire. It's always worth checking to see what is on offer at the moment. Do you want to holiday near Angel Barn (29172), you can see other cottages within 25 miles of Angel Barn; have a look to find your perfect holiday location.